Rosemount on the Bench - A three bedroom home, also offered as an outdoor event venue for a maximum of 60 people. This gorgeous historic property was converted from a pop-factory into an extraordinary home, now being offered to visitors from around the world. The building was constructed in 1917 and operated as Rosemount Orchard and Springs and later converted to this gorgeous home and property it is today. Many of the original artifacts can be found around the home. 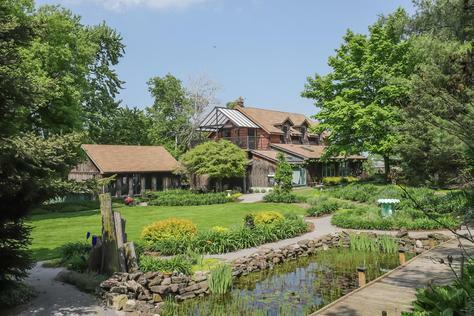 This gorgeous property was converted from a pop-factory into an extraordinary home, now being offered to visitors from around the world and located on Niagara’s picturesque (Beamsville) Bench Vineyard Trail. Its location is 500m from the Bruce Trail – a UNESCO world biosphere reserve and less than one kilometer to Mountainview Conservation Area. This Gem of a property is in walking distance to seven wineries and a short drive to hundreds of Niagara’s award-winning wineries. The property is 4 km from QEW. Call us for information on event pricing and details. This property has 1 King(s), 1 Queen(s), 1 Queen(s), 1 Trundle Bed(s).